“The problem with the lionfish is it’s like Darwin’s nightmare,” Oliver Steeds said, standing on the deck of the Baseline Explorer. A late afternoon sun dwindled over the 146-foot research vessel, as it sat anchored in St. George’s Harbour on Bermuda’s northeast corner. Licks of ocean water dried off a gold-plated submersible parked next to Steeds, the director of a deep ocean exploration project called the Nekton mission, as he recounted the basics of the invasive species. “Lionfish are chowing their way through the food chain, because they don’t have any predators,” Steeds said. Since then, lionfish have terrorized Atlantic waters, their ferocious appetites upsetting the balance of reef ecosystems. Such was the case near the Bahamas between 2003 and 2009, where lionfish overconsumed juvenile parrotfish and other young plant eaters. The result: Algae bloomed with abandon, choking the reef ecosystems at a 150- to 200-foot depth. Coral coverage shrank by as much as 88 percent in places; sponge coverage by 96 percent. “In U.S. waters, we know the lionfish are consuming a number of economically important species too, like snapper, grouper and even spiny lobster,” said ocean ecologist James Morris of NOAA’s National Ocean Service. What’s more, lionfish multiply swiftly. A single female spawns every two to three days and can lay 2 million eggs in a year. Two species of lionfish — Pterois volitans and Pterois miles — now threaten reef ecosystems across the Western Atlantic and the Caribbean. But a solution may be on the way, in the form of a robot. In a way, the lionfish terminator — not the robot’s official name — is cousin to a vacuum cleaner. The idea surfaced in the fall of 2015, when Colin Angle, the CEO for iRobot and the maker of the Roomba robotic vacuum, paid a visit to friends on Bermuda. During the visit, Angle and his wife, biochemist Erika Ebbel joined a group of locals and sailed offshore for a dive. With them was Chris Flook, who had a long relationship with lionfish. As a collector of marine specimens for the Bermuda Aquarium, Museum and Zoo, Flook had been one of the first people to notice lionfish in Bermudian waters in the early 2000s. For unknown reasons, sightings began to surge up and down the Atlantic around the turn of the millennia. Lionfish began outcompeting Bermudian predators, like groupers, for food. Groupers feed in spurts, Flook said. They eat and then chill out for a few days. By comparison, lionfish feed constantly, which Flook and other experts blame on a hunting technique developed in their native range. In the Indo-Pacific, small species see the spiked barbs and know to retreat, so the lionfish must work hard for its meals. Fish in the Atlantic, however, are naive to the danger and don’t flee. Flook did early experiments when he noticed the invaders, where he put lionfish and Bermuda’s dominant reef predator in separate tanks. He then collected juvenile bream fish from an enclosed bay, which he suspected had never come in contact with a grouper or lionfish. As the invasion grew, Flook and a collection of local divers founded the Bermuda Lionfish Task Force, which holds daily dives and fishing tournaments to rid their waters of the invasive species. On that fall day, while the group ate their catch on the boat, Flook and the other Bermudians recounted these stories of the lionfish, and Angle had a thought. After the trip concluded, the Angles laid the foundation for Robots in Service of the Environment (RISE). The independent, nonprofit company has recruited a league of engineers and scientists — all volunteers — to establish a skynet for lionfish. Gardner, for instance, is coordinating the robot testing. Meanwhile, Ed Williams, an ROV (remotely operated underwater vehicle) designer at Robo Nautica in California, is pitching in weekends to engineer prototypes. 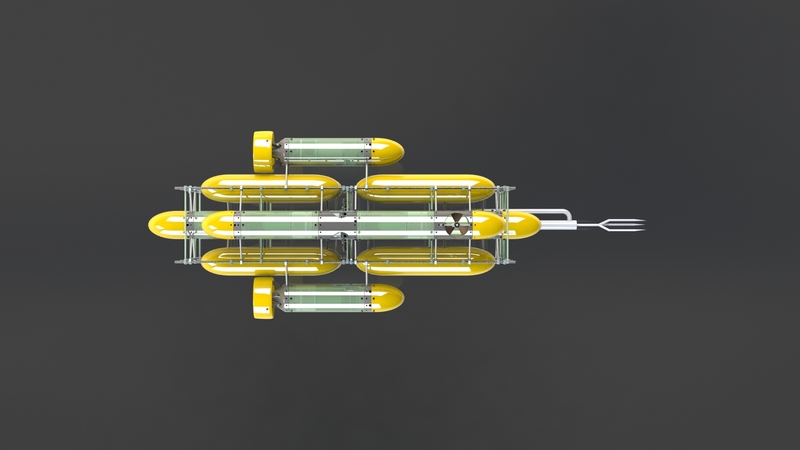 Two ROV designs are leading the way. One model carries a spear gun, matching how human divers typically harvest lionfish. The second model will electrocute the lionfish by using a robot arm equipped with two metal electrodes. “When the probes get to either side of the fish, you basically zap it,” Rizzi said. To start, each model will sport video cameras, so a pilot can guide the ROVs from onshore or inside a boat. 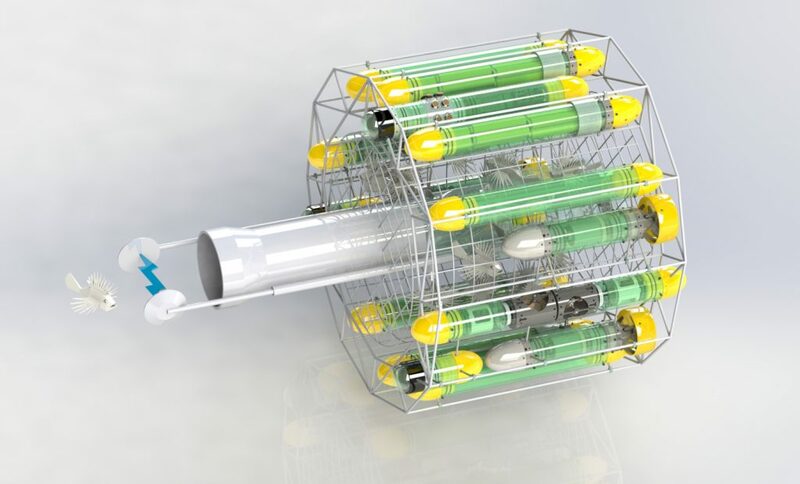 But the team’s long-term plan is autonomous underwater robots that hunt lionfish on their own. One of the first steps in development, especially for the zapper model, is observing how lionfish might react to an approaching robot. But here’s one advantage for the RISE team. Due to their venomous barbs, lionfish have few predators. As a result, they don’t automatically flee when approached. To keep other nearby fish from being zapped, Rizzi and the other designers are relying on ocean chemistry. Saltwater is highly conductive, so they expect it should act almost like a straight wire between the two electrode plates. The team is testing the shocking mechanism on lionfish in aquariums before rolling out the design into oceans. RISE hopes these robots will appeal to fishermen, who are looking for ways to supply lionfish to restaurants — a growing sustainable market. Morris, who isn’t involved with the RISE project, said NOAA is actively engaged in the creation of lionfish-trapping tools for the deepest parts of the reef. This outlook includes robotics. “We are very excited about the application of robotics in marine conservation,” Morris said. “But whether or not a lionfish-killing robot is practical or not is yet to be determined. The accuracy — or its ability to discriminate lionfish from other fish — is one concern, he said. It’s no accident that Bermuda was picked as a testing ground for these robots. Local scientists have recently learned that the island’s lionfish invasion may differ from the rest of the Western Atlantic. Along the U.S. coast and in the Caribbean, shallow water reefs tend to be invaded with lionfish. Thanks to a grant in 2013 from the U.K. Department of Environment Food and Rural Affairs, Goodbody-Gringley and her colleagues conducted dives around the island to track lionfish populations. In an upcoming publication in Marine Ecology Progress Series, they report Bermudian lionfish congregate in their densest populations on deep reefs situated 200 feet underwater. Other areas — such as North Carolina, Florida, the Gulf of Mexico and the Bahamas — record high densities of lionfish in shallower water, closer to shore. The lionfish palate differs near Bermuda too. “Overall, we’re most concerned with crustaceans, because it’s surprising how many are consumed,” said Corey Eddy, a soon-to-be-minted PhD student at the University of Massachusetts Dartmouth. Eddy, who is first author of the upcoming study, addedthat red night shrimp “are taking the biggest hit imaginable.” These skittish creatures appear to drop their guard around lionfish, even occasionally mistaking the predators for rocks. One minute these crustaceans are hiding; the next, they’re lunch. This naivety occurs in juvenile fish too. Lionfish also disrupt reef ecosystems by targeting baby bluehead wrasses and other cleaner fish. “Cleaning stations are areas on the reef where our [native] predators don’t eat the other fish,” Flook said. Akin to how we go to doctors to get checkups, the reef fish have these areas, which are like no-feed zones. Except lionfish don’t abide. Flook said lionfish target these cleaning stations in Bermudian waters, not only eating the cleaners but all the fish in need of a tune-up. It’s a dilemma, and the Bermuda Lionfish Task Force, of which Eddy and Goodbody-Gringley are also members, has tackled the invasion around shallow corals. Members of the team even launch dangerous technical scuba dives to depths of 200 feet to catch lionfish. “It’s a risk every time we don a rebreather and go down to 200 feet,” Goodbody-Gringley said. That’s why she, Flook and the others teamed with Nekton and RISE. Nekton is using its submersibles to gauge lionfish populations lower than 200 feet, while RISE’s robot may provide a safer alternative to hand culling lionfish at risky depths. Obviously in this case, lionfish are paying for our mistakes with their lives. But, is that fair to the lionfish? Sure, humans created this problem, which endangers red night shrimp, bluehead wrasses and countless other animals. A lionfish, however, is a living creature too — one that didn’t purposefully migrate into our waters. Neither Schubert, nor the AWI, advocate the killing, particularly the inhumane killing of any species, but he said in this case the science is pretty clear that lionfish do have an adverse impact on the ecosystem. 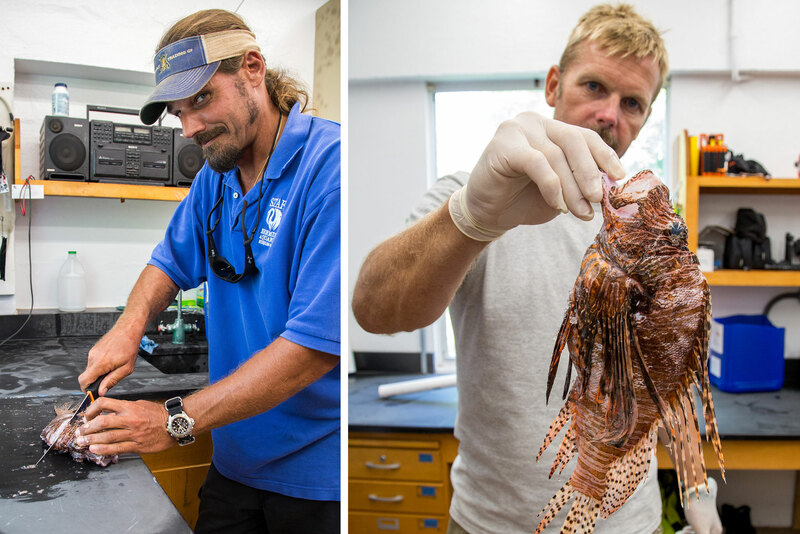 “To the extent that the experts believe lionfish have to be killed, we simply say that it has to be done as humanely as possible,” Schubert said. This is where he becomes nervous about a lionfish-culling robot. He worries robots may leave the door open to animal cruelty. Spearing is considered the most humane way to kill lionfish, but what if the speargun robot misses the mark? The zapper robot has the humane advantage of evolution — other fish will flee, while the lionfish won’t. Yet there’s always a chance that fisherman might target another bold species. NOAA’s James Morris agrees that lionfish culling programs must be humane. But he doesn’t see any ethical issues with utilizing lionfish as a commercial resource to sustain the native balance of ecosystems. “But if we’re looking for an ethical question, it’s the one behind introducing non-native species and the impacts that it has on the region and the biodiversity of these very important places,” Morris said. There have been discussions about restricting imports of the eight or so species of lionfish, he said, but at the moment, the federal government doesn’t formally track how many lionfish enter the country or their populations in U.S. waters. Florida, however, banned all lionfish imports to the state in 2014. Morris doesn’t believe culling programs can fully eradicate lionfish from the Atlantic. There are simply too many. But NOAA is confident that lionfish control plans can effectively protect conservation areas like national parks, marine sanctuaries and refuges. These plans would end with forcibly removing lionfish from protected areas and start with keeping lionfish out of the aquarium trade. “So prevention is absolutely key here in terms of outreach with the public,” Morris said. Genetic analysis argues every single lionfish in the Atlantic descended from fewer than 10 lionfish females. 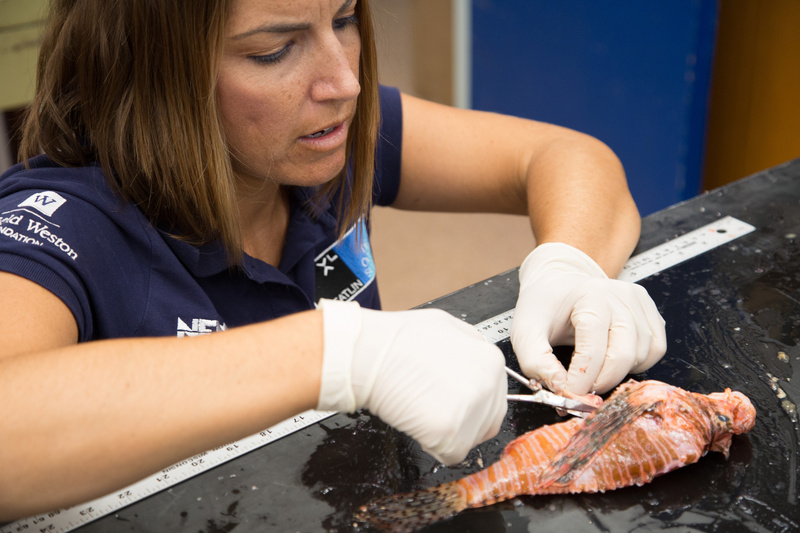 If you see a lionfish in the wild, you’ll quickly realize why this process took 30 years. Lionfish paddle slowly across the coral bed, and the stealthy predator rarely travels far from home. Eddy described their march across the seas as little grenades peppering the water. A slow creep to an uncertain end. 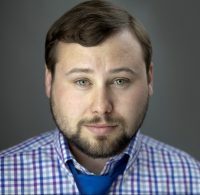 Matt Ehrichs is a general assignment producer for the PBS NewsHour. He is also co-creator of the award-winning web series, ScienceScope. 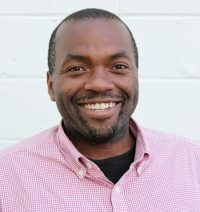 Before joining the broadcast and digital production team, Matt provided mentor and creative support to the next generation of storytellers with the PBS NewsHour Student Reporting Labs.